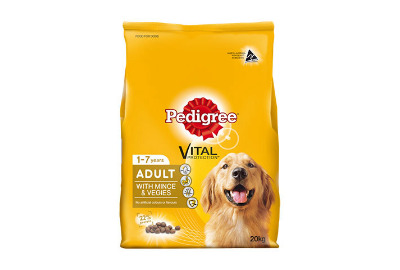 Pedigree Dog Food Meaty Bites is a special blend of Omega 3 and 6 fatty acids combined with minerals to keep your dog in top health and promote a shiny coat. Meaty Bites contains a unique dental kibble to promote chewing and help keep your dogs teeth and gums in peak condition. It is also specially formulated with a unique blend of antioxidants including vitamin E and C which help to promote a healthy immune system. Oral health - Crunchy Pieces - Kibble provides gentle abrasion against the tooth surface helping to promote good oral health. Digestion - Dietary Fibre - Made with whole grains and added beet pulp to help regulate movement through the gastrointestinal tract and promote a healthy digestive system. Skin & Coat - Omega 6 & Zinc - Enhanced levels of Omega 6 fatty acids and Zinc helps maintain a healthy skin and coat. Immune Support - Vitamin E - Enriched with Vitamin E, an antioxidant, to help support their immune system. 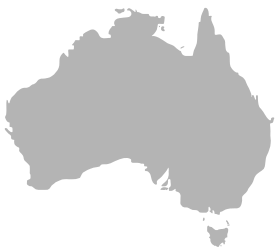 For sheep-mustering, tail-wagging, loyal working dogs. This Pedigree blend is made for the dogs who never tire of harsh conditions, jumping on and off utes, and following your commands. It provides a high level of protein to ensure your working dog gets all the amino acids needed replenish, repair and develop muscles. 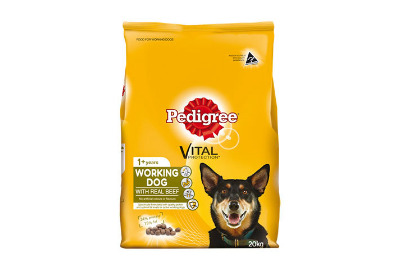 Pedigree Working Dog promotes a long, active lifestyle by supplying a unique blend of antioxidants, scientifically proven to help strengthen the immune system of working dogs. Quality protein & optimal fat - Quality protein ensures your working dog gets all the amino acids they need to help replenish and develop their muscles. Also contains optimal levels of fat to ensure your dog has the energy to work all day.